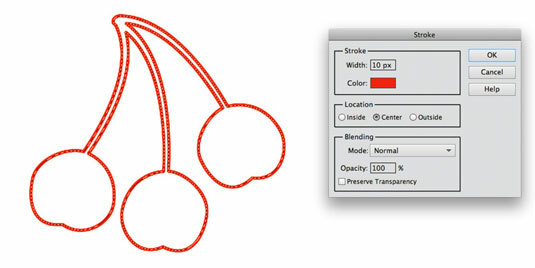 Stroking in Photoshop Elements 11 enables you to create colored outlines, or borders, of selections or layers. It’s up to you to decide whether to put the border inside, outside, or centered on the selection. In the Tools panel, choose a foreground color. In the image, make a selection on a layer using the selection tool of your choice. Although you don’t have to create a new layer to stroke a selection, we recommend it. That way, if you don’t like the stroked selection, you can just delete the layer and your document remains unadulterated. Width: Enter a width of 1 to 250 pixels. Color: Click in the Color box to select the hue you want from the Color Picker. Location: Specify how Elements should apply the stroke in relation to your selection border. Note that the Inside option always gives you sharp corners on a rectangle. The Center and Outside options can result in blunt corners. *Mode: Determine how the stroke color interacts with other colors on the same layer. *Opacity: The default value is 100%. If you want the stroke to be semitransparent, enter a lower value. Preserve Transparency: Select this option to apply the stroke to only nontransparent pixels. Note that if you choose this option on a new, blank layer, nothing is stroked. Click OK to apply the stroke. Rather than use the Stroke dialog box to adjust the Mode and Opacity settings, create a new layer for the stroke and then choose different Mode and Opacity settings in the Layers panel. This approach gives you better flexibility in editing.